Asep holds a doctorate in economics from the Australian National University in Australia, a master's degree in economics from Pennsylvania State University in the USA, and an undergraduate degree in agribusiness from Bogor Agricultural University (Institut Pertanian Bogor). 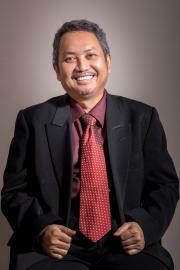 Before assuming his current position as director in 2009, Asep was SMERU’s deputy director for research from 2003 to 2009. Among other roles, he was previously a senior researcher at the Center for Policy and Implementation Studies (CPIS). Currently Asep serves as a member of the Editorial Board of the Bulletin of Indonesian Economic Studies (BIES) and also as a member of the Advisory Board of Indonesia Project, both at the Australian National University. Asep was awarded the H.W. Arndt Prize, given to the best article by one or more Indonesian authors published in the Bulletin of Indonesian Economic Studies (BIES) each year, for the article 'Minimum Wage Policy and Its Impact on Employment in the Urban Formal Sector', published in BIES Vol.39(1), pp. 29-50, April 2003 (jointly with: Wenefrida Widyanti, Daniel Perwira, and Sudarno Sumarto).